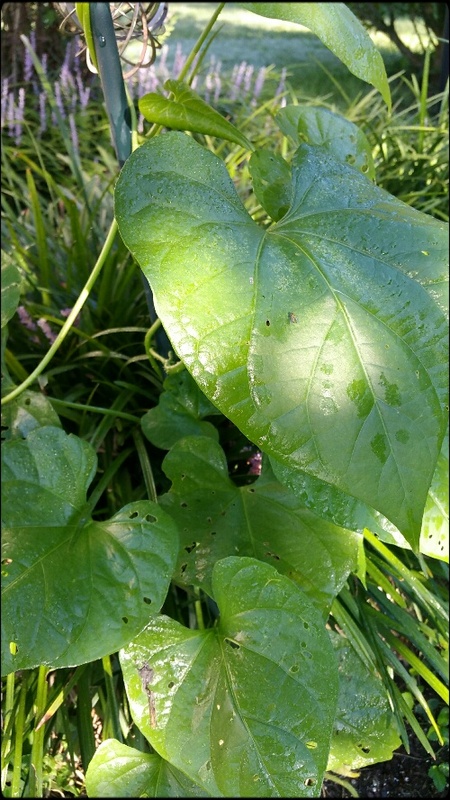 I planted morning glory seeds late in the season, almost at the end of the time recommended on the back of the seed packet. Most of the seeds sprouted and after thinning them the vine has grown taller than I am at 5’10”. Six-plus feet in about three weeks. I find this miraculous. The steps to get there are complex. Roots absorb water and nutrients from the soil. Eukaryotic cells create chlorophyll from sunlight to produce energy. The plant cells multiple at a staggering rate. The plant grows. I spend most mornings on the patio with a cup of coffee watching this same process at work in other plants, the birds, the deer, in me. Expand that out and realize it’s happening all over the world, and quite probably on other worlds, and pretty soon you’ll freak out because it’s just too much to comprehend. I can’t decide if it’s comforting or disconcerting to contemplate. Human beings add a layer of complexity to the mix by introducing desire. Beyond our basic need to water, feed, and shelter ourselves, we pursue pleasure, strive for happiness, cultivate joy. For most of us, it isn’t enough to only live. We want to live life to the fullest and get the most that we can out of it. The verdict is still out on whether this is beneficial to life or not. 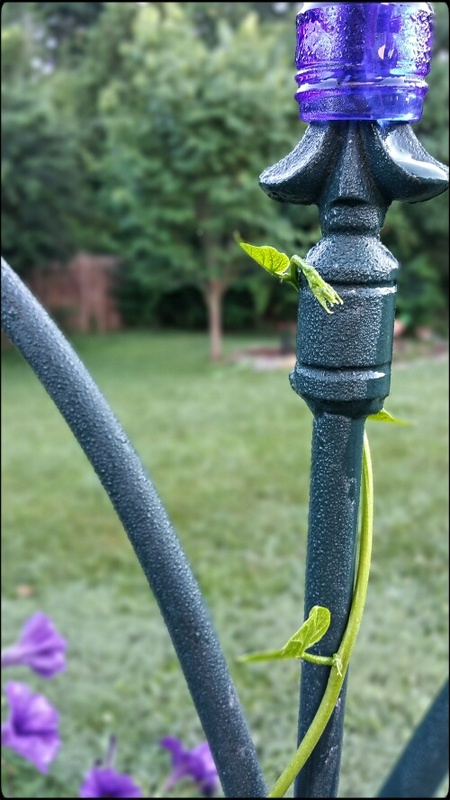 On the one hand, that morning glory wouldn’t be thriving if I hadn’t planted it. On the other hand, today is trash day and at the end of every driveway at every home in my neighborhood sits at least one trashcan, full of waste that represents each homeowner’s attempt at being happy over the last few days. These trashcans appear twice a week year round. Again, thinking about that happening all over the world, day in and day out, just might freak you out. There’s a maxim I try to follow that helps me with this. It is “do no harm.” It sounds simple enough, but it isn’t simple at all. For example, today I plan to mow the yard. This is a simple enough task that will bring happiness to me. But to mow I’ll use my terribly inefficient mower that uses gas and oil that spews harmful carbon dioxide into the air. 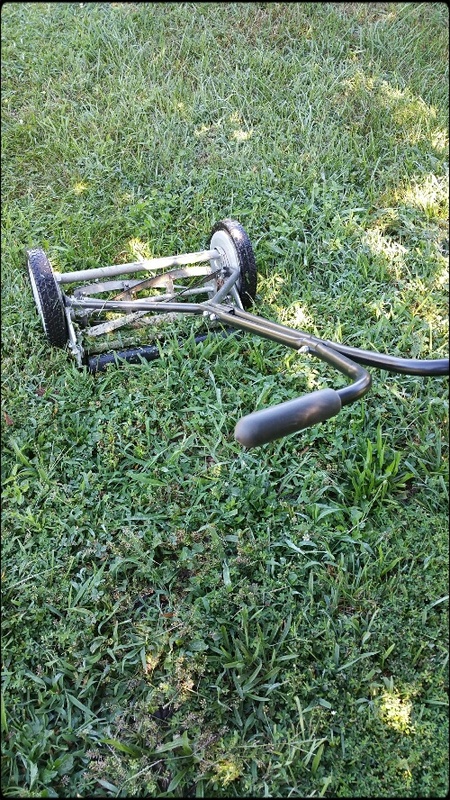 I could use an old fashioned rotary blade manual mower, but it’s time consuming and difficult. Actually…Damnit! Sometimes I think my biggest problem is I think too much. This was a lovely read. Thank you for posting it. All we can do is try to lessen the harm we do or the amounts consumed. Every little things adds to another little thing and before you know it it’s a big difference. We cannot do without, but the statement “Less is more” helps me to do with less.